How to Choose the Right-Sized Heater? If you are looking for a space heater for your home or office, undoubtedly you will be wanting one that is as energy efficient as possible. You will hopefully have already concluded that it is all very well staying warm, but that’s no use if the energy bills end up sky high. The answer is to find the most efficient space heater, but as there are so many different types it can become confusing knowing which to buy. This is where our review of the most efficient space heaters will help you, as we assess five very different space heaters which have proven to be very energy efficient. Our followed buyer's guide will also assist you to learn more about what kind of heaters are energy efficient. Due to the way they produce heat, micathermic space heaters are known to be very energy efficient and this one from DeLonghi is no different. Heat is generated by the heating elements and the mica which surrounds it conducts that heat which radiates out into the room without the need for noisy or inefficient fans. You can control the heat output using the control dials on the side of the heater. These let you select the high setting at 1500 watts or the low one of 750 watts. Thereafter you can adjust the temperature further using the thermostat control. The space heater unit can be wall mounted or it can sit on the floor. If on the floor, there is a tip-over safety cutoff in case it gets accidentally knocked over. There's also an overheating sensor which switches the heater off if the temperature gets too high. 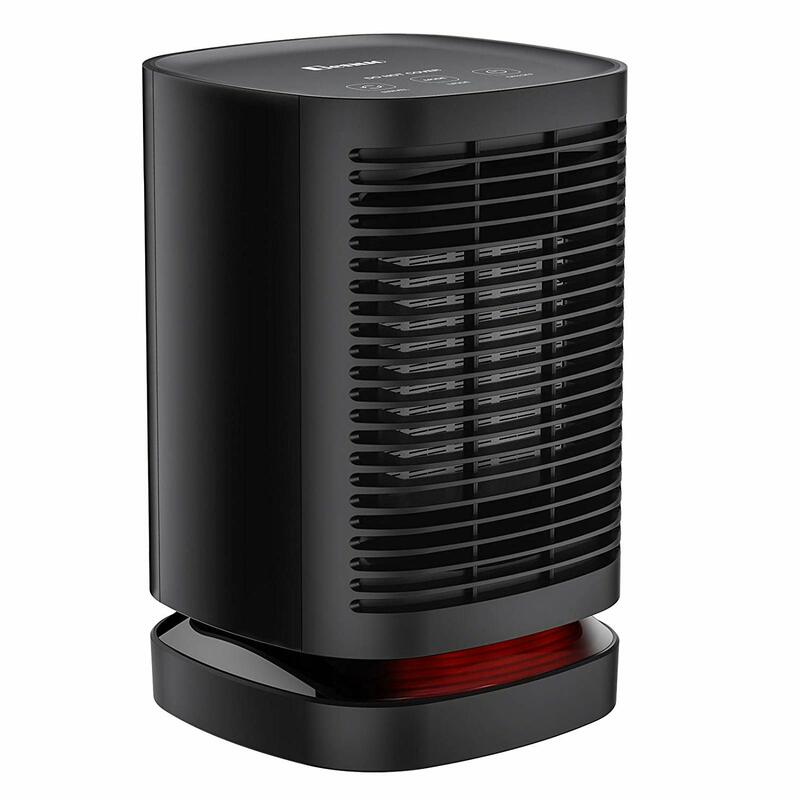 This space heater utilizes highly efficient infrared heat which then radiates out into the room. Apart from its energy efficiency one of the main benefits of using this type of heater is that it does not dry the air in the room, which some other heater types tend to do. Part of its efficiency is based on the fact its radiant heat can be used to heat a zone in a room and therefore allows you to switch off your central heating as there is no need to heat the entire room. With a maximum output of 1500 watts, you can control the temperature in the room using either the digital control panel on the front of the heater or the more convenient way, which is using the remote control. It is also a very safe heater thanks to its overheat sensor which switches the heater off if it gets too hot. The heater's unit stays cool to the touch which makes it safe to use when you have children in your home. Find more infrared heater products' review in our infrared heater buying guide. Ceramic convection space heaters are not always regarded as the most energy efficient, but this little heater is one of the exceptions. The reason is that it is designed to heat very small areas and does so quickly, efficiently and very quietly too. Its maximum output is just 950 watts, so it is going to require less energy than most other space heaters, regardless of how they operate. Nevertheless, this is still enough to heat the part of the room you are in. It is especially good for home offices or lounges as it is small and light enough to sit on a desk or side table. When you switch in on you can set the heat to high or low, and you also have an option for the heater to oscillate from side to side. In warmer months you can have it running with just the fan to help cool the room. It is also a very safe space heater thanks to cutoffs for both overheating and if it gets knocked over accidentally. Find more ceramic heater products' review in our ceramic heater buying guide. For those that want an efficient space heater, but also would like a degree of style and design in your home, an answer is an electric fireplace which uses infrared heat. This electric fireplace from Lifesmart is one such heater, which produces heat quietly and efficiently via its infrared quartz heating process. This electric fireplace can make it feel warmer even when not producing any heat thanks to its log effect and imitation flames which always make the room feel cozy. The dark oak colored fireplace surround and mantel add even more to the visual appeal of this heater. To control the heat levels, it has a digital control panel on the front, but even better is the fact that you can control it from your armchair using the remote control. This lets you select one of the three heat levels which go to a maximum of 1500 watts and set the 12 hour on/off timer. Find more electric fireplace products' review in our electric fireplace buying guide. As efficient, portable heaters go, this oil-filled radiator from Delonghi is one of the most popular space heaters on sale today. A lot of that must come down to how energy efficient it is thanks to the fact that it can heat entire rooms so well that you do not the central heating switched on in there. It is effectively a plug and play heater which you plug in, switch on, and then set what level of heat you want. It is rated up to 1500 watts, but you can select a lower setting too. Thereafter you can use the thermostat to adjust the heat to exactly the level you want. Its casters mean you can wheel it from room to room and as it only weighs 25 lbs., it can be carried up or down stairs depending on where it is needed. Its overheat cut off means it is safe to be used in children's bedrooms or playrooms. As it is sealed the oil will never need to be refilled and so the heater is effectively maintenance free. Find more oil-filled heater products' review in our oil-filled heater buying guide. Almost all space heaters will be fuelled by one of the following four; Electricity, Natural Gas, Kerosene or Propane Gas. They all have their own unique characteristics, with advantages and disadvantages of using each of them. Here is easy to follow guide which should help you compare each of them and make your choice more informed. One of the biggest advantages of an infrared heater is that they turn all the electrical energy that is powering them into heat. This occurs because, unlike many other heaters, an infrared heater does not heat the air in the room it is located. Instead, it radiates heat, in the same way that the sun does. As infrared heaters use electricity to power them, they use a fuel source that does not always compare favorably to the cost efficiency of natural gas, for example. However, the process by which it heats a room means it can cost as much as 67% less than some other electrical heaters such as those which use convection heat. It is often claimed that electricity is '100% efficient' as all the electrical energy is turned into heat. The true figure is actually 99%, but we're sure you won't be too concerned about the missing 1%. You also need to take account of effects like LED glow logs and other features that use the electricity to power them. Bear in mind this is not the same as cost efficiency which takes account of the price of a fuel. Compared with gas or coal fireplaces which require a flue or chimney, an electrical one wins hands down in terms of cost efficiency. It does so due to considerable heat loss up those flues or chimneys, which obviously it does not have. The others may produce more heat, but they also lose a lot of it too, which means they’ll burn more fuel to maintain a given temperature. As oil filled space heaters are powered by electricity, they inherit the '99%' rule that other electrically powered heaters benefit from. Where it gains an even greater advantage is the characteristics of the diathermic oil they are filled with and how it reacts when the heater is switched on. In comparison to other substances diathermic oil can absorb high levels of energy, and thus the heat it produces lasts for a very long period. This means that the heat output from the heater is maintained for longer, and so the thermostat does not have to switch it on again as often. This makes the cost-efficiency of an oil-filled heater higher than most other electrical heaters. Ceramic heaters tend to be convenient and portable and they’re ideal for heating up a small area very quickly. They do this better than many other heater types, but on the flip side they fall behind the others in relation to cost efficiency. A ceramic heater operates using convection heating which means that it is heating up the air in the room. Apart from some of this heat being lost to drafts or open doors, it can be difficult to maintain a steady temperature in the room. Heaters are often set at maximum rather than adjusted which increases the amount of electricity used, even when it is not always necessary. Heaters fueled by kerosene have the obvious drawback that you have to keep refueling them. Some lazier people might regard this as using too much energy of their own. For the rest of you, that relatively minor inconvenience means that you have a heater which in many circumstances is one of the most cost-efficient heaters available. One of the best ways to take advantage of that is to use a kerosene heater as a supplemental heater in your home. It is ideal for when you need to heat up a small area, rather than switching on your central heating which would cost more to heat that same small area. Natural gas heaters are so efficient that there are some energy experts who will tell you that it is cheaper to have one in each room than it is to have ducted gas central heating. We are not suggesting you rip out your central heating system, but it is certainly worth noting how efficient a small gas heater can be. It is also the case that the cost per heat unit of most gas heaters beats almost all similar sized electrical ones, with the odd exception where a gas fireplace has a flue, for example. How efficient a propane heater is going to be for you will be influenced by the price you pay for it. As this differs across the country, you'll need to assess whether your local prices make it feasible or not. The difference can be as much as 44% less than, or almost double the national average so variances can be huge. Seasonal price differences can also be a factor. These two types of baseboard heater have very different ways of operating and they also have variances in their efficiency levels too. A standard electric baseboard heater operates in a similar fashion to a convection heater which is not as cost-efficient in comparison to the other types we have looked at. A hydronic baseboard heater will normally have much higher upfront costs than an electric one, but over the longer term, it should prove to have lower costs. This is due to the water inside being able to retain heat for longer, and meaning less energy (electricity) is required. Just as a skilled professional would always seek to use the correct tool for the job, getting the most cost-effective heater is about selecting the correct one for your needs. A heater which is suitable for heating large areas is the wrong choice if all you need it for is a small bedroom. Likewise, a small space heater will constantly be on full blast, wasting energy, and still not provide enough heat, if it is the only heat source in a large open plan living area. The cost of running a heater is greatly influenced by how much heat can be retained in the room. If a lot of heat escapes the heater is on for longer at a higher setting and thus costs more to run. One of the best ways to address this issue is by properly insulating your property. A home which has full and proper insulation should always have lower fuel costs than one which doesn't. This is because the heaters in it do not need to be on for as long, nor set as high, as there is more heat being retained in all its rooms. Based on the same principle as insulation, reducing the number of drafts in your home will mean greater cost efficiency. Much of what is required is relatively simple to do, like not leaving doors propped open, closing windows properly, or repairing cracks in internal and external walls. Using draft excluders for doors and windows will also be a massive help in reducing drafts. For those heaters which have the means to select or adjust their output, such as a dial or switch, you should choose the heat level wisely. An obvious one is not to have the heater constantly on its highest setting when a lower one would be enough to heat the area. Turn it up if you need to, but also turn it down when possible if you want to reduce your heating costs. This will apply mainly to portable heaters, although you should certainly consider carefully where any fixed heaters are to be installed too. For portable heaters, think first about safe positioning with respect to children and pets. Thereafter, and given that heat rises, place the heater on the floor, rather than on a table, as the lower half of the area isn't going to get any heat. Try to avoid having a heater near open windows or doors. Common sense is one the best ways to make your heaters more efficient. What we mean by that is apart from positioning them correctly, and choosing the right setting, do not use them in ways that simply waste money. As with any appliances, heaters will work more efficiently if they are maintained properly. The specifics of the maintenance may differ between heaters, but whatever the manufacturer's advice or instructions are with regards to keeping the heater in good working order, please follow them. Lack of maintenance means you may have a heater that is having to work harder to maintain heat, or not producing the amount of heat it should. Whichever it is, it means you are wasting fuel or energy, and both mean the cost of running your heater is more than it should be. There is a simple way to ensure that the heater you are buying has the heat output for your needs, as opposed to using a heater that is too high or too low in terms of its energy rating. This does involve some simple calculations, but we promise there is nothing that you need a mathematics degree to work out. The first step is to measure the dimensions of the room, so for our example, let's say you have a room which is 10 feet x 15 feet. To calculate the area, we multiply these two figures together, so this gives us 150 square feet. To determine the rating that we need for that size of room, we simply multiply the room size by 10. With our example, we have 150 x 10 which gives us 1500. So, any space heater which has a rating of 1500 watts is suitable for that room. You may come across some space heaters which are not rated in watts, but in British Thermal Units, or BTUs as they are more likely to be called. To convert BTUs to watts you divide them by 3.14. So, a heater with an output rating of 4500 BTUs is the equivalent of 1433 watts which we round up to 1500. We hope you have found our reviews and buyers guide useful and that they will help you to choose the most energy efficient space heater you want. 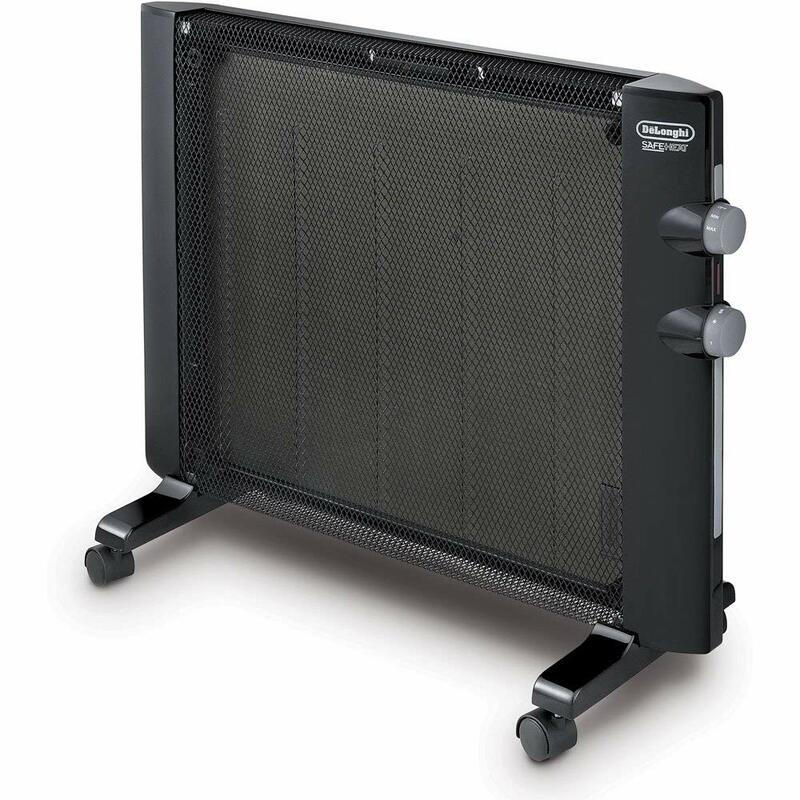 Although we think each of them is excellent, the one which stands out for us and which we believe is the most efficient space heater is the DeLonghi EW7707CM Portable Oil-Filled Radiator Heater. We love how portable it is and therefore, be used to safely heat any room in the house. It is very easy to use, and its adjustable heat settings ensure that you can maintain the optimum temperature in the room, without using more energy than is needed. In fact, its heating power lets you reduce your central heating settings which save you even more money. It is maintenance free, and should, therefore, be able to provide you with efficient heat for years to come.